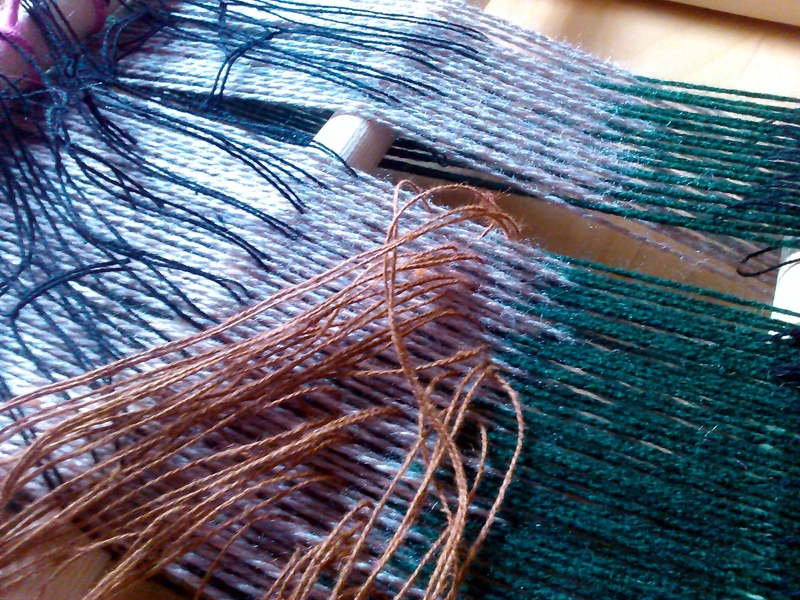 After writing the 4 shaft loom simulation the next job was to try weaving the structures with real threads. Would I be able to replicate the predicted patterns and structures? Ellen warned me that the meander weave would result in unstable fabric, but it would depend on the nature of the material used so was worth trying. 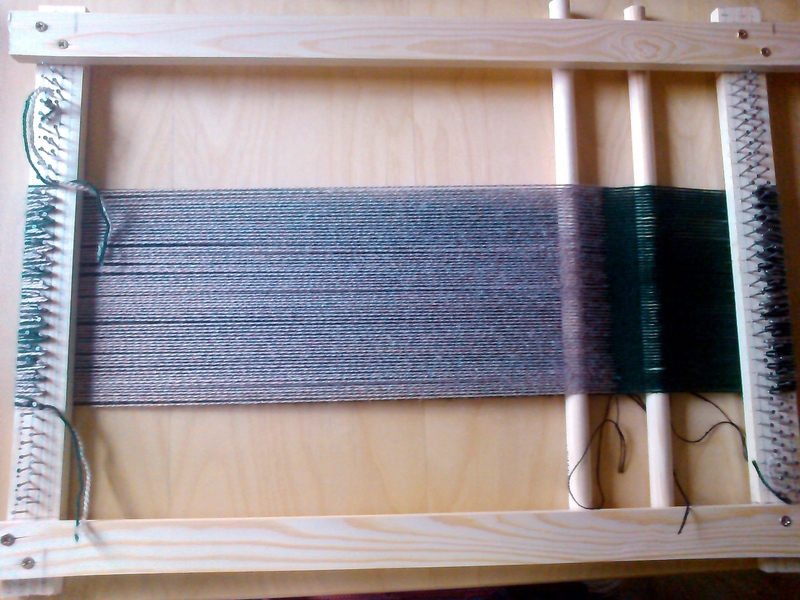 Originally I planned to warp up the Harris loom but I need to work up to that as it’s a big and complex job, so I quickly built a frame loom with some bits of wood and nails at 5mm intervals to hold the warp in place. Here you can see it set up with the all important first ‘shed’ (name given to the gap between subsets of warp theads), which defines the order of the threads. I packed the warp too tightly and messily so this was important – luckily as the yarn colours alternate so it made it easy to make. 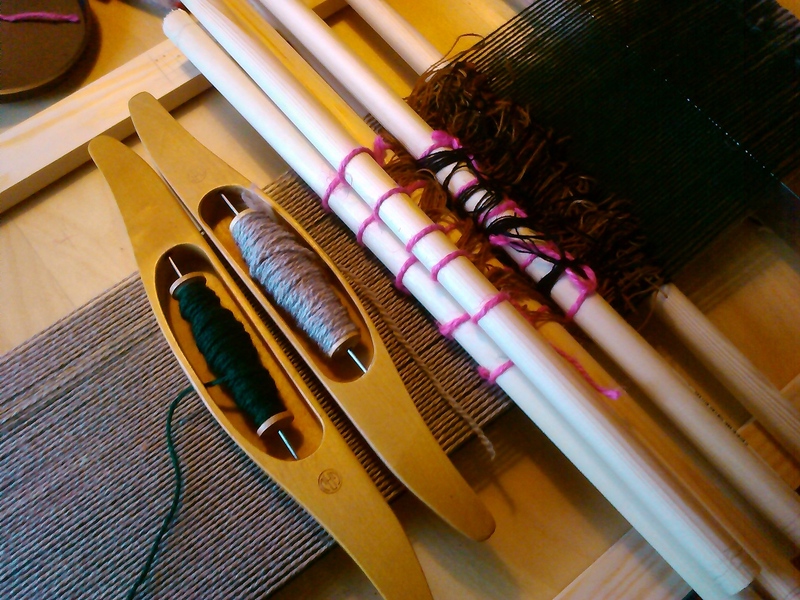 Here I’m sleying the shafts using threads to pick up the warp as defined by the simulation toggle buttons. The threads (which form heddles) are tied on to wooden poles which are pulled in different combinations during weaving. This is the approach we saw on the warp weighted looms in Copenhagen, I’m not sure if it’s usually used on frame looms – it was cumbersome but much faster than counting threads manually each time. It’s important to use thinner threads than the warp, but you need to put quite a bit of tension on them so they need to be strong. There is something very appropriate in the context of this project about coding threads with threads in this way. Here it is finished and ready to start weaving. I numbered the shafts with pencil but it’s actually very obvious based on the order they are attached so I never used them. Following the lift plan from the simulation was quite easy, thinking about the pattern more than the combinations of numbers – as I went on I could tell where I was based on the nature of the shed, keeping an eye on the rhythm of the warp threads picked up. Also the parts where I need to lift 3 and leave 1 was really tricky – not helped by the fact that the resulting weft was difficult to see at that point. In relation to livecoding, I was surprised to the extent that improvisation is required when weaving even based on a predefined pattern. There is a lot of reasoning required in response to issues of structure that cannot be defined ahead of time. You need to respond to the interactions of the materials and the loom itself, the most obvious problem you need to think about and solve ‘live’ is the selvedge – the edges of the fabric. In order to keep the weave from falling apart you need to ‘tweak’ the first and last warp thread based on which weft yarn colour thread you are using. 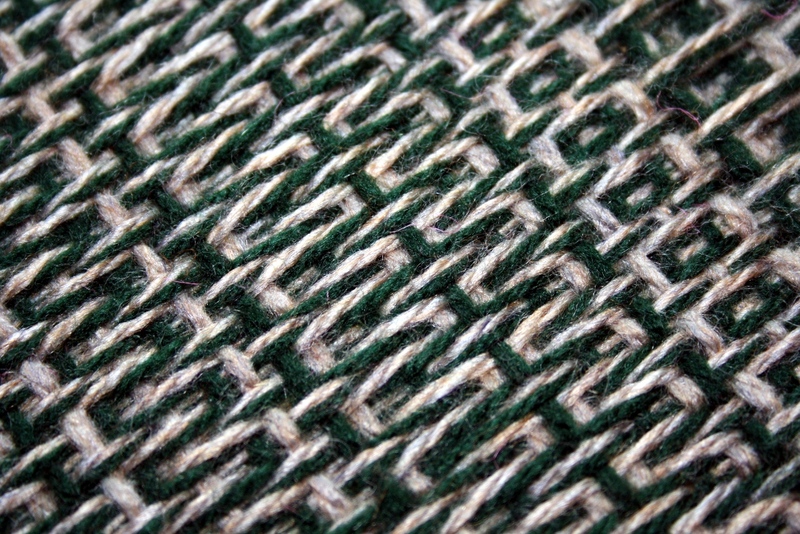 The different weft threads also need to go over/under each other in a suitable manner which interacts with this. This will be important to include in the simulation properly, but this will only give an early indication of problematic decisions, rather than a failsafe solution. 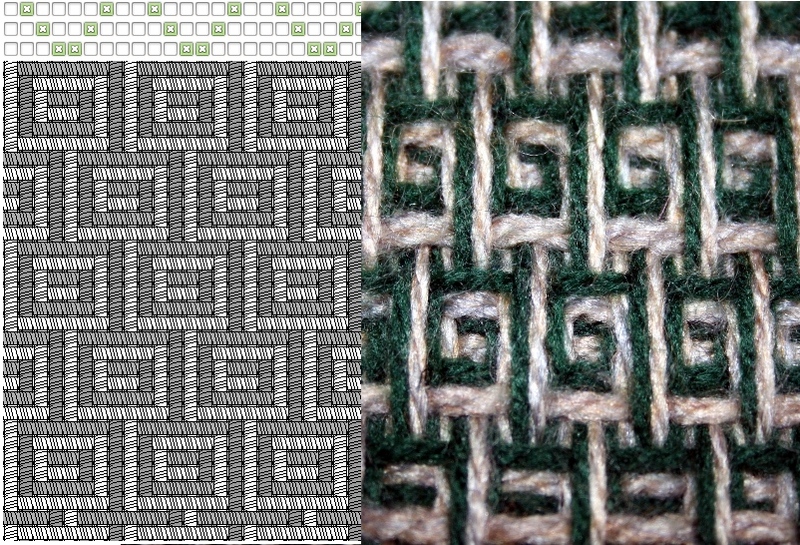 Here’s a closeup of the meander pattern compared to the simulation. The yarn is cheap and a bit fuzzy, but hopefully you can see the structure – the differences are interesting. I’m not sure how this will distort further when I remove it from the loom and the tension is gone. Here are some more freestyle patterns, the boxy ones turned out to be more stable than the meanders – it’s really satisfying to see them emerge from the abstract set of rules that you work with to lift the shafts, not unlike graphics programming. Which of the 4 shafts to lift can be thought of like 4 bit opcodes with different ordering resulting in indirect pattern shifts. There are three types of limitation that I’d like to note and think about (especially in terms of incorporating them in a programming language). One is the selvedge, as I mentioned earlier – another is floats, which cause the problems on the meander pattern (long threads not incorporated into the fabric). 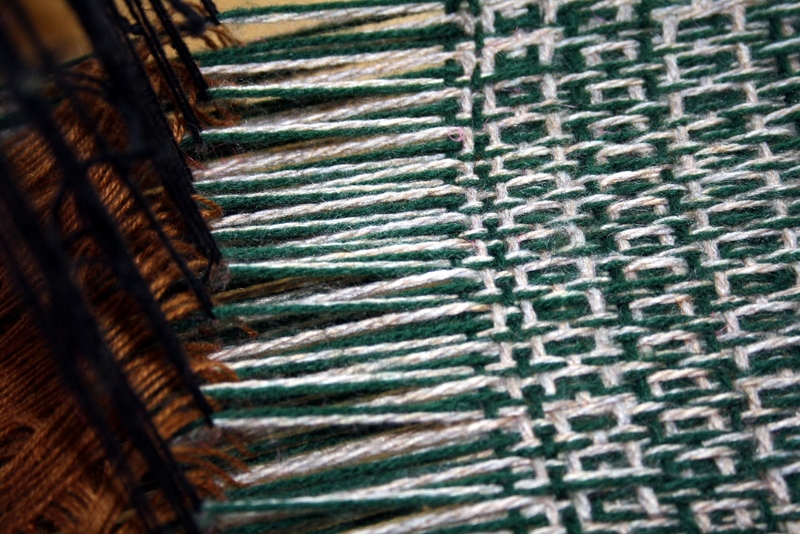 The third is more subtle, some sequences of sheds cause problems when packing down the weft, for example if you are not too careful you can cause the ordering of the weft colours to be disrupted in some situations.